Plain Language Marketing is dedicated to providing help for small and micro business owners. On the blog we offer tips and quick tutorials for non-marketing oriented small business owners and bloggers. Through our services we can update or create an easy to use website, email campaign or set you up on social media. Our goal is to help people better understand internet marketing and how they can improve their website's usability and search rankings. I understand the small business owner. I know you're overworked and wear too many hats. You're often the boss, the labor, the accounting and the janitorial staff. There's no reason you'd have the time or energy to make your website stronger. I'd like to help. In the blog section of the website you will find a number of micro-tutorials written with as little marketing jargon as possible. If you do your own website you can follow the posts on the blog. 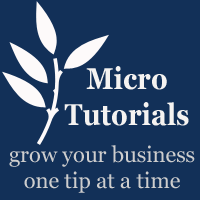 These micro-tutorials will give you one tip. One single small little thing that you can do to make your website more attractive to the search engines (like Google or Bing). This is called SEO (Search Engine Optimization). If you make changes little by little with these micro-tutorials, you will soon have a better looking and easier to find website. If you have no desire to update your own website or need help creating a new website that you can later update yourself, let's talk.